MTV is back in the lesbian-storyline game this season since recently revealing that Death Valley zombie-battling cop Carla (Tania Raymonde, Lost) loves the ladies. In an interview with Fearnet, Raymonde talked about her character’s sexuality and what’s coming up for her during the first season of the half hour horror-comedy series. 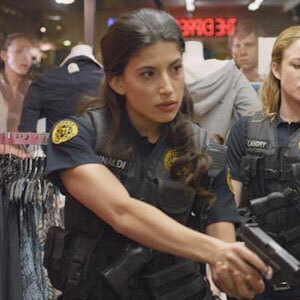 MTV is back in the lesbian-storyline game this season since recently revealing that Death Valley zombie-battling cop Carla (Tania Raymonde, Lost) loves the ladies, AfterEllen reports. In an interview with Fearnet, Raymonde talked about her character’s sexuality and what’s coming up for her during the first season of the half hour horror-comedy series. During the fifth episode of Death Valley titled Zombie Fights, Carla being a lesbian was revealed to viewers. In the episode titled Tick Tick Boom, viewers met Carla’s girlfriend. “We meet her girlfriend and there are some funny scenes with Carla and her girlfriend and John-John (Texas Quency Battle, The Bold and the Beautiful), who refuses to believe that Carla is a lesbian – despite very concrete evidence that she is,” Raymonde told Fearnet. As for what else to expect for Carla, other than the obvious massive amounts of blood and gore that come with being an Undead Task Force agent, viewers will get to see some different sides of her. “As the season progressed, we got a little more comfortable with Carla, gave her a little more color, and she gets to have a little more fun at the end,” Raymonde explained. Catch new episodes of Death Valley at its new time – 11:00 EST Monday nights on MTV.